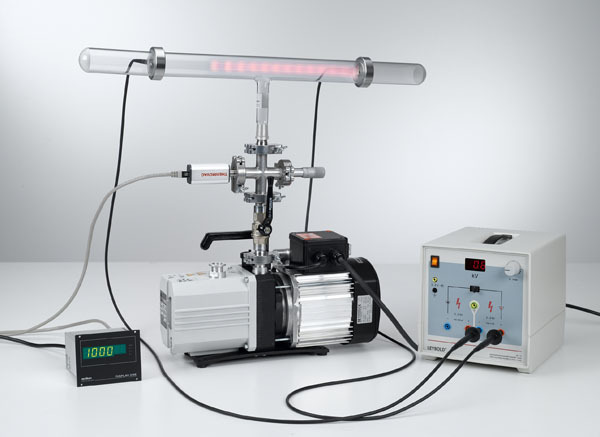 In the experiment P3.9.2.1, a cylindrical glass tube is connected to a vacuum pump and slowly evacuated. A high voltage is applied to the electrodes at the end of the glass tube. No discharge occurs at standard pressure. However, when the pressure is reduced to a certain level, current flows, and a luminosity is visible. When the gas pressure is further reduced, multiple phases can be observed: First, a luminous “thread” joins the anode and the cathode. Then, a column of light extends from the anode until it occupies almost the entire space. A glowing layer forms on the cathode. The column gradually becomes shorter and breaks down into multiple layers, while the glowing layer becomes larger. The layering of the luminous zone occurs because after collision excitation, the exciting electrons must traverse an acceleration distance in order to acquire enough energy to re-excite the atoms. The spacing of the layers thus illustrates the free path length.